Please see below snippets of reviews and also links to articles on some of our concerts. A 4-star review of our Charity concert in June 2013 by the Yorkshire Evening Post can be read here. "Vocal soloists Daniel Auchincloss, Imogen Creedy, Stuart O'Hara, Bertie Yates and Bryan White made a terrific impression as did those soloists drawn from the chorus"
"The performance was really good and extremely enjoyable. Please pass on my compliments to both Peter and the orchestra who did a splendid job both technically and certainly from an interpretative perspective"
"... The balance / blend of the choir was superb: they’re a very talented group." I absolutely loved the concert yesterday. In fact I was quite "transported"...I loved it all and in particular the Litany and all its complex groupings . As a Catholic I am well aware of Litanies and church Latin. It was maybe only my personal impression on the day but I found it possibly the most exciting and uplifting of all the concerts I have been to. I'm so glad I was able to go to the concert yesterday. It was a great success and such good listening from start to finish. I was unfamiliar with much of the music. There was something for everyone. Singers, players and audience. The more light-hearted second half was never in danger of becoming banal and a good sign was that everybody seemed to be leaving with a smile on their face. It must have been a pleasure to take part. "[The performance] was a life enhancing jewel in the sea of mediocrity which surrounds us!" 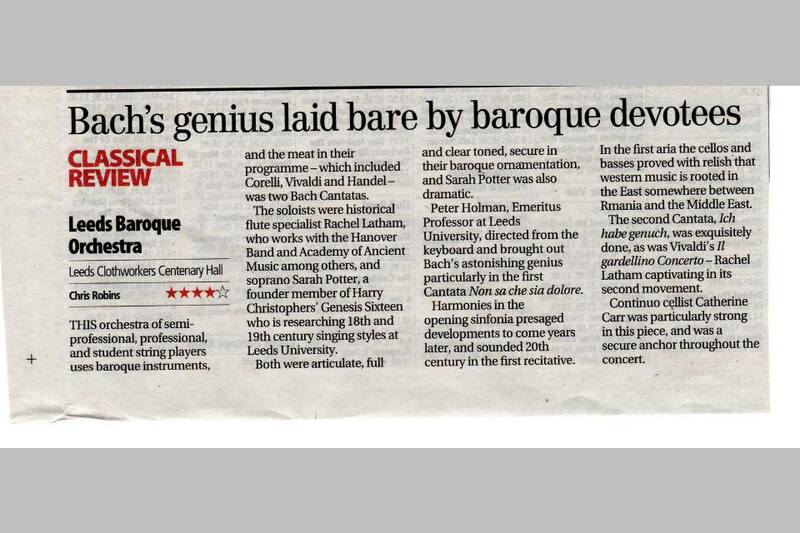 Another lovely performance by Leeds Baroque Orchestra at Huddersfield University yesterday. An interesting selection of pieces requiring some almost 'theatrical style' scene changes as soprano Sarah Potter slipped seamlessly in and out (although to familiar applause) as the orchestra 'morphed' into a series of different quartets and line ups to feature soloists and guest players from the University. Sounds distracting but wasn't. Done mostly under the cover of appreciative and substantial applause, served effectively to punctuate the changes...While not wishing summer away, already looking forward to Bach senior's Mass in A major, to be performed on 7th December, Bach at Christmas concert. Like the brilliant March performance of the Mass in B minor, suspect it will be a sell out so get your tickets sooner rather than later". "Fabulous, first time I had seen Dido enjoyed every minute, as did my friend who came up from London just for this!!!" "Another superb concert from Leeds Baroque Choir and Orchestra yesterday at Saltaire...A veritable musical feast, with lovely harmonies and rounds from the choir, accompanied and punctuated by a series of dances, beautifully played by the members of the orchestra and setting the scene for the soloists to perform some tricky vocal gymnastics, topped off with soprano 'magic' from Sarah Potter...A very well performed and well received concert, crowned by a grand and well deserved ovation, thank you once again Leeds Baroque. Hopefully get to Huddersfield next Sunday for a bit of JC Bach and Mozart and no doubt more magic." "The B minor Mass was truly awesome. I’ve still got goosebumps from thinking about it. Thank you all so much." "Sometimes you just have to rearrange things or make sacrifices to be there. The Leeds Baroque Choir and Orchestra's Mass in B Minor by J. S. Bach, performed to a full house this afternoon, was one of those occasions. The massive ovation at the end said it all. A misbehaving organ stop lightened the mood briefly... and may even had the master turning in his grave but from now on will be remembered as the 'Clothworkers Variation'. Nice to see the soloists and orchestra sections and choir take deserved bows, especially the first cello, who apart from the interval played through almost every bar of the concert." "[Bach's] Cantata Ich habe genuch was exquisitely done as was Vivaldi's Il Giardinello concerto - Rachel Latham captivating in its second movement. Continuo 'cellist Catherine Carr was...a secure anchor throughout the concert"
"What an exciting ensemble, music cunningly articulated...every work delivered different colours and emotions"